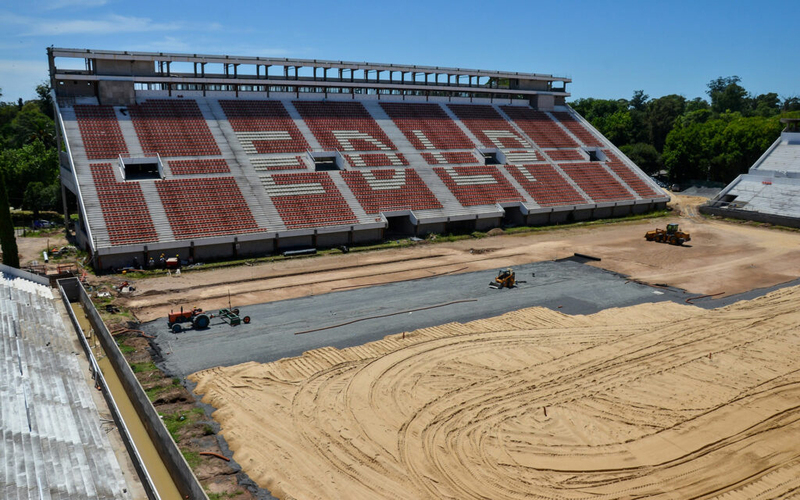 With funding for the stadium secured, new home of Estudiantes de La Plata is progressing well. From the ground level to the very top you can see changes, beginning with private parking and basis for basketball court and ending with preparation for the steel roof structure on top of the main stand. Staircases, masonry, fire safety system are either delivered or soon to be complete. From construction, workers in these areas turn to paintwork, while images released by the clubs show even finishing works in toilets being advanced. Most importantly to fans, the field of play should once more turn green sooner than later as subsoil layers are 60% ready. In mid-February the new surface should arrive. 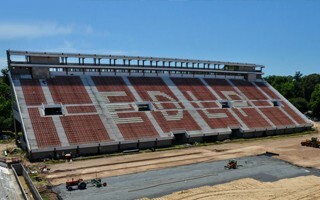 Estudiantes will use the PlayMaster hybrid surface. Although it's considered a 'lay-n-play' surface, the team will allow it to grow roots throughout March. As supporters wait to return home, good news came in recent days regarding a temporary solution. Having played most of their recent games away from the home city, in Quilmes, 'Pincha' are returning to La Plata and will use the famous Estadio Unico. In order to accommodate upcoming games priority was given to football over concerts at the city's largest stadium, pushing a gig by Ska-P to a different venue.